My blog is one year old this November. I still consider myself very new to the blogging universe. My blog is still in its infancy, it is what it is. A blog. My blog. I don't get nearly enough time to spend on it, but I truly don't mind, as the only people putting pressure on me to get a blog post up or to update my pages with information, is me. The IFBA had recently put up a link on their site to this great blog post here by Joy The Baker http://www.joythebaker.com/blog/2011/11/10-real-talk-blog-tips/ she really does echo a lot of what I feel about blogging, though I am not nearly as dedicated or as good at it as she is. It's been one heck of a year. A near fatal car accident put all that is important to me in perspective (see my Absent Without Leave post for details, I actually find it difficult to go and read it back now). My family comes first. After that, everything else is an added bonus in my life, including this blog. I also learnt not to take what I do so seriously and to let everything breathe a little. I'm an extreme control freak, I really am. Anybody who knows me, knows this truth. After my accident, I learnt to let go a little. It has made me an easier person to live with. At the very least I find it easier to live with myself. I learnt how to make a soft boiled egg. I know. I bake pastry and doughnuts, but never knew how to boil an egg properly. I do now. Exciting times. I also learnt to ignore every 'how-to' advice article on taking pictures or writing my blog. Blogging has been a very organic experience for me. Though I'm not comfortable using buzz words to describe my feelings, this seems the most appropriate. All those 'Improve your picture skills' and 'Get more traffic' and '10 best things you need to know' lists go right over my head. I personally found that I like to take things at my own pace and do things my way (control freak, anyone?). I don't mind broadening my horizons and learning neat tips and tricks. The thing is, I'm fed-up of being told endlessly by someone else, that my blog could be improved or that my pictures can be better! I already know it can be improved and that my pictures can be better. Details, details, details - too many details. I quite like the way my blog already is. It is very me. My blog was born out of a frustration for lack of easy access to the gluten free world. My time on the internet has opened up my eyes to what's out there in terms of resources and how willing people are to help. I'm humbled by my blogging experience. I'm humbled by the businesses who give me their time willingingly. I'm grateful to the people who have donated their efforts to me and who have allowed me into their world. I'm absolutely floored at how kind people are in their attempts to help me achieve my goal for my blog. My goal simply being that I've only ever wanted to share what I've learnt about being gluten free to anybody who is also trying to do the same thing. Simple as that. If it has slightly helped one person in any way, my blog has done good and if someone liked looking at my pictures along the way, bonus! I think the thing I find most shocking is that I actually do have people who read my blog. Seriously. If you're reading this, you're one of them! Thank you! I like being able to reach out into the ether and throw words out there and get a reaction. Or not. I like that there is someone who has decided to give my blog some of their time. Time is precious. So to you fine people who read my blog, I'm flattered and grateful and thank you! 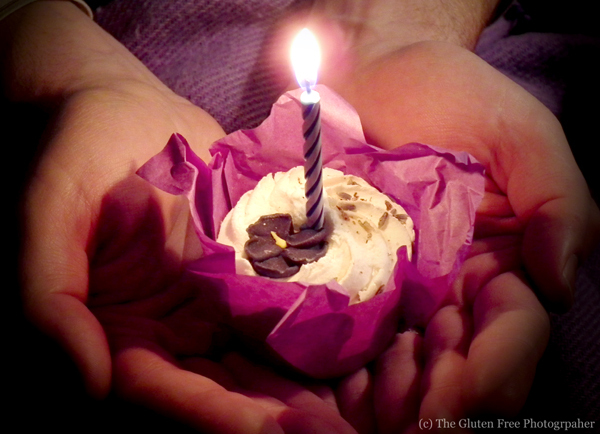 So there you have it - Happy First Birthday to my blog! I can only hope that I can keep my interest going so I can be around to ramble on about it for it's second birthday...!